Attica's Ben Shewry shares his salad, which he varies to keep things interesting. "Every day I make it differently, and sub in different vegies and dressings. Often it has a fermented edge with kimchi or sauerkraut, it just depends on what I have at hand. It makes me feel good and I can balance out my eating if I eat this way most of the time. It means if I want to indulge a little tonight I can without beating myself up." 1. Combine miso, walnut oil, water and lime juice in a bowl and whisk to make dressing. 2. Place shredded dill, parsley and cucumber in a large bowl and add dressing and a small pinch of salt. Toss gently and transfer to a plate. 3. Cut eggs in half and season with salt and a few drops of hot sauce. 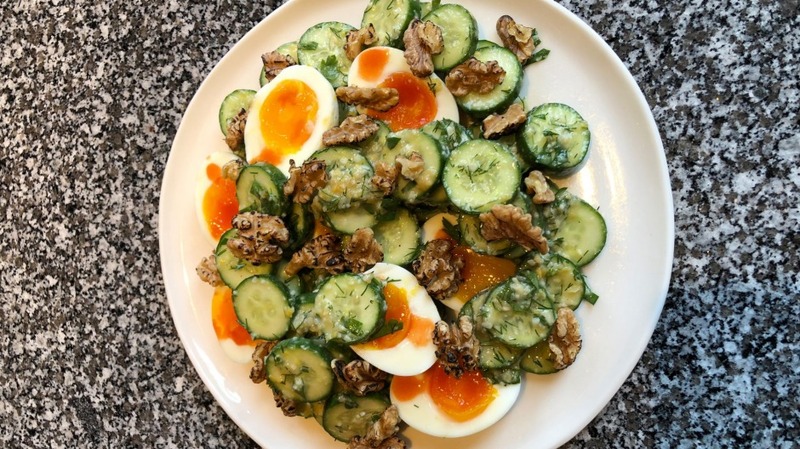 Place the egg halves on top of the cucumbers and finish with walnuts. Serve immediately.